He was then transported back to the wild, where he’s probably still bragging to his buddies. December 13th is the ‘National Day of the Horse’ in the US. Yes, we realize you weren’t aware of that fact. That’s why My-West is here! Don’t you just savor those rare occasions when our lawmakers actually get something right? 4.6 million Americans are involved in the industry. The horse industry has a direct economic effect of $39 billion annually. The industry directly provides 460,000 full-time jobs. Obviously Zeus the watch-cat was Lion down on the job. Caught napping, our fearless feline awakened to the pitter-patter of Puma paws on the back deck of this Boulder, Colorado home. In a classic case of fight or flight, Zeus…did neither. Obviously, he couldn’t be bothered. It’s hard to tell who got the best of this stare-down but Zeus didn’t seem too perturbed. Our young mountain lion soon tired of efforts to bond with his domesticated cousin. He wandered into the yard and appeared to be rather enamored with the statue of…what else…a mountain lion. Eventually, his mate joined him….a mini puma pride. Zeus bears a striking resemblance to our neighborhood wild cat, Apollo…and we DO live at the foot of Mount Olympus… . This family of rambunctious bruins scrambled up an Aspen tree near Whitefish, Montana. No one knows why…confusion…fear…we’re guessing it probably wasn’t the view… But they sure brought traffic to a halt on highway 93 as nearly 100 cars stopped to take a look. Authorities say it’s pretty uncommon for a black bear to have a litter of five baby bruins. They attribute it to the abundant food in the region over the past few years. Kind of makes you wonder how many house pets have gone missing in that period, doesn’t it? And now it’s time for Cubs Vs. Cougars…let us know which you’d rather cuddle with and why! No, this is NOT Paris, Texas, nor Paris, Idaho, nor Paris, South Dakota. This is the fashion capital of the world... Boulevard Saint-Germaine des Pres, to be exact. And these gorgeous steaks are affaire de la ville...yes, you can order french fries to go with them. 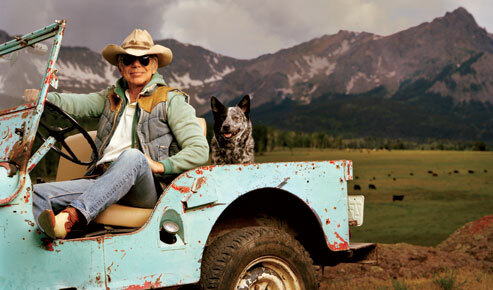 The restaurant is called Ralph's, on the ground floor of the Ralph Lauren Paris store and those carnivorous cuts of beef are flown in from his Double RL Ranch in Telluride, Colorado. Even the video introduction to the Saint-Germaine Store is gorgeous. Upstairs on the sixth floor, you'll find the Double RL & Co. Store. Lauren's western look took Paris by the horns and now Europe's second Double RL has opened in London. Only Lauren could come up with timeless clothing and accessories like this. Lauren inaugurated his Paris store last year, having personally overseen the renovation of a 17th century residence in one of the city's most exclusive neighborhoods. Aides say he wanted to evoke the glamour and artistic spirit of Paris, while adding an American touch. Vogue magazine enthused "RL managed to respect the architecture of the period magnificently." By the way, Paris, Texas is the second largest Paris in the world with 26,000 residents and a replica of the Eiffel Tower...it's the second version...the first was blown to bits by a tornado. Given his brand name, you might expect a parade of polo ponies, but Ralph Lauren has chosen a western wedding fiesta for the marriage of his son David and Lauren Bush…granddaughter of president number 41 and niece of President number 43. ‘41’ won’t be attending because of the altitude…’43’ reportedly is. The wedding is being held on Lauren’s 17-thousand acre Double RL ranch near Telluride. Security is tight but word has it a western saloon has been set up along with Tipis and cabins, not to mention mountain scenery right out of the John Wayne version of True Grit. Country singer Michael Martin Murphey leads the entertainment line-up. The dress code is described as ‘black tie with a western twist…’ I guess if you’re going to tie the knot it may as well be a sturdy cowboy bowline. By the way, the bride says she’s eager to take on the name Lauren Bush-Lauren…”I’m sort of old-fashioned that way,” she swoons. Guests will also be invited to a Labor Day rodeo at nearby Ouray County Fairgrounds. They’ll be sitting out on the grandstands…no air conditioned box seating at this event. Ralph Lauren is one of the world’s richest men with an estimated fortune of $6-billion. But locals describe him simply as “the nice guy who owns the Double RL Ranch.” He recently told Oprah Winfrey, “I’m not a cowboy and don’t pretend to be one, but I love the West.” Which makes him an honorary member of the My-West family.